First and foremost: today most academic authors, writing about humans, are important or at least interesting. The following short list is only to give you an idea of my thinking. I name them from memory. 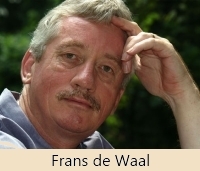 Frans de Waal, with his books Chimpansee politiek (1982), Good Natured (1996) and Bonobo (1997). Marvin Harris Our Kind (1989). Jared Diamond Guns, Germs and Steal(1997). Roger Fouts Next of Kin (1997). Johanson & Shreeve Lucy’s Child (1989). Chagnon Yanomamö. The Fierce People (1983). Steven Mithen The Prehistory of the Mind (1996), After the Ice (2003). Steven Stanley Children of the Ice Age (1996). Michael Corballis The Lopsided Ape (1991). Ad Borsboom De clan van de Wilde Honing (1996). Aah! Much-much more books. But this is only to give you an idea. And it was not all from memory: for each book I stood up and reached to the shelf above my head, put it before my nose to write the title and year right. I read four newspapers each day, cut important articles or items and the clippings come in tabloid size scrap-books of 250 pages (I am now at volume number 37). I can recover the articles in a card system. The same applies to what I find on internet and what I print out (very much). When the pile of prints is about two centimetres high, I glue the pages to an hardcover book, number the pages and start to read. Each article is noted down on the front, so is easy to recover. My little house is full of bookshelves; I’m busy with download no. 323. A humanosopher is reading from breakfast till he switches off his bedside lamp (with the only break for the daily walk and the trip to the supermarket).